I am standing on a cliff, gazing southwest into the reddish-brown expanse of the Sacramento Valley. 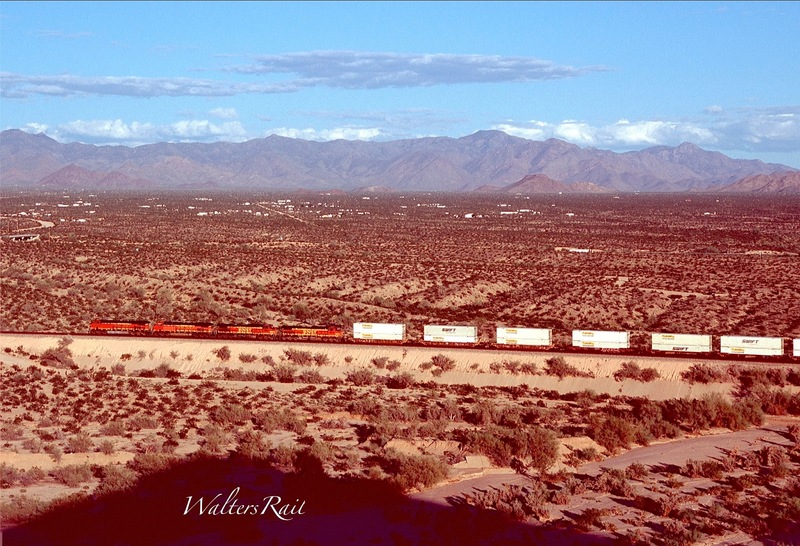 I see mountains overlooking the Colorado River and Needles, California – 60 miles distant. I see dust devils rising above the sand like crepe paper. 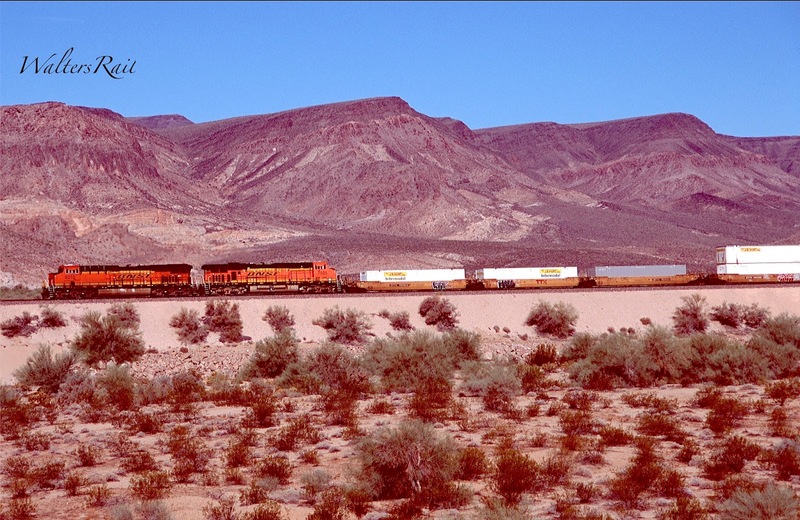 I see the triangular headlights of an approaching BNSF Z-Train. 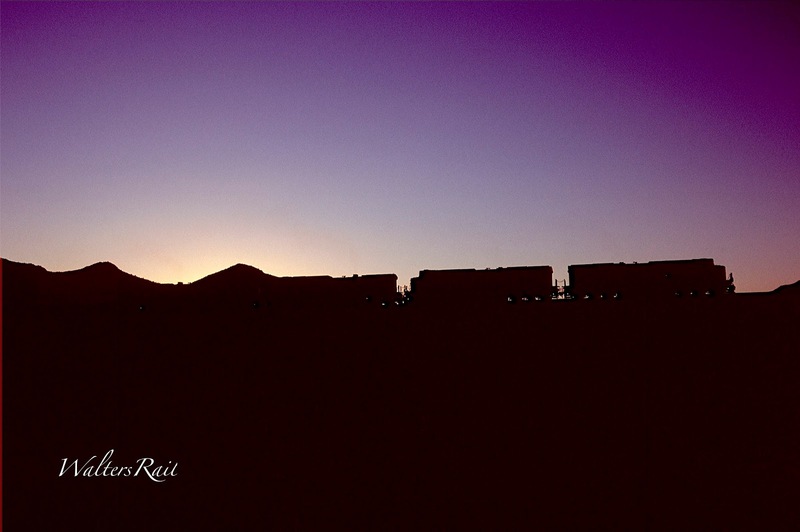 Soon I hear 12 cylinder diesel engines and the rush of steel wheels on steel rails. 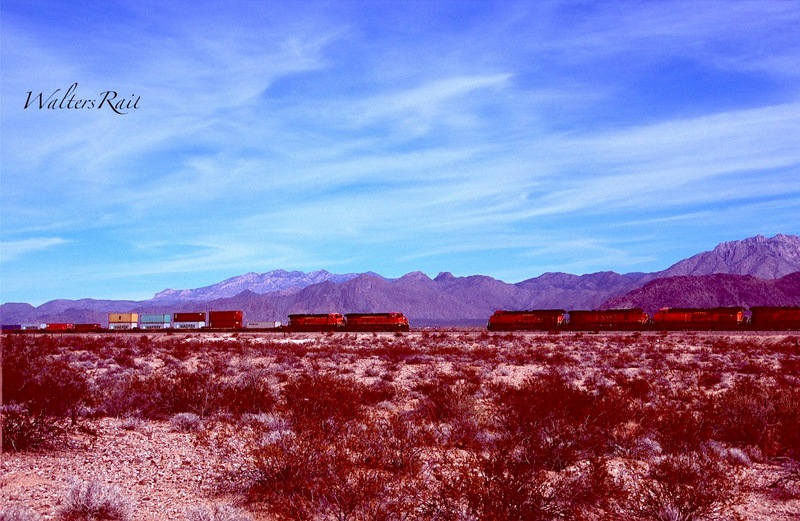 If I lived my life in a single day, I would live it standing here, watching the desert and the trains struggling through it. The Sacramento Valley runs roughly from Kingman, Arizona, in the north to the junction of the Sacramento Wash with the Colorado River on the California border to the south. Interstate 40 follows the valley north and south, though the road is an east-west thoroughfare from North Carolina to California. 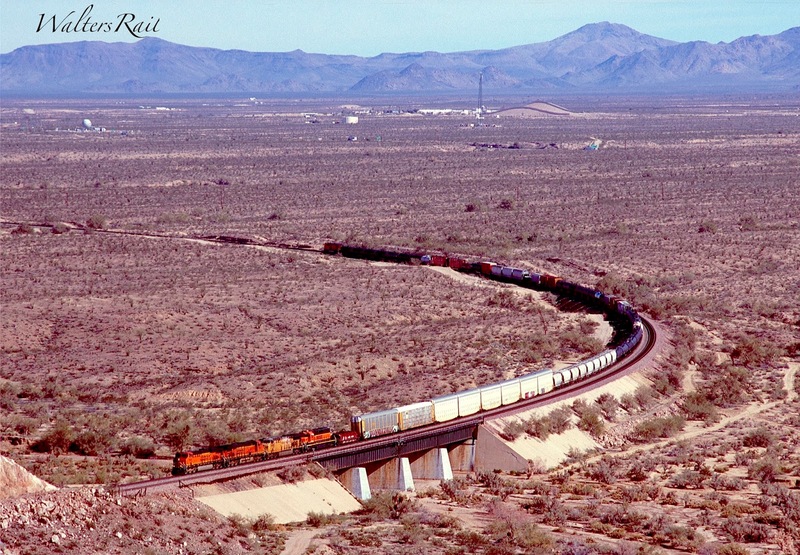 I-40’s predecessors – the National Old Trails Road and Route 66 – also run through the valley, as does the BNSF, successor to the Atchison, Topeka and Santa Fe. The valley slopes dramatically upward from south to north. 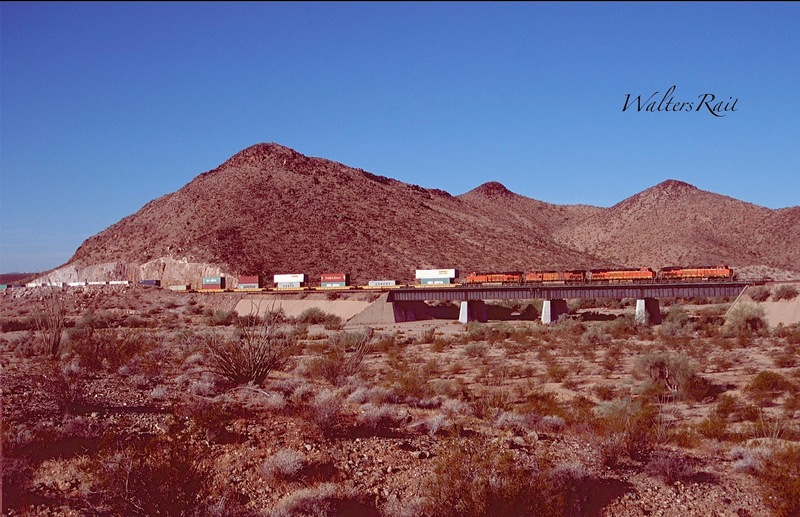 Needles, California, rests 495 feet above sea level. 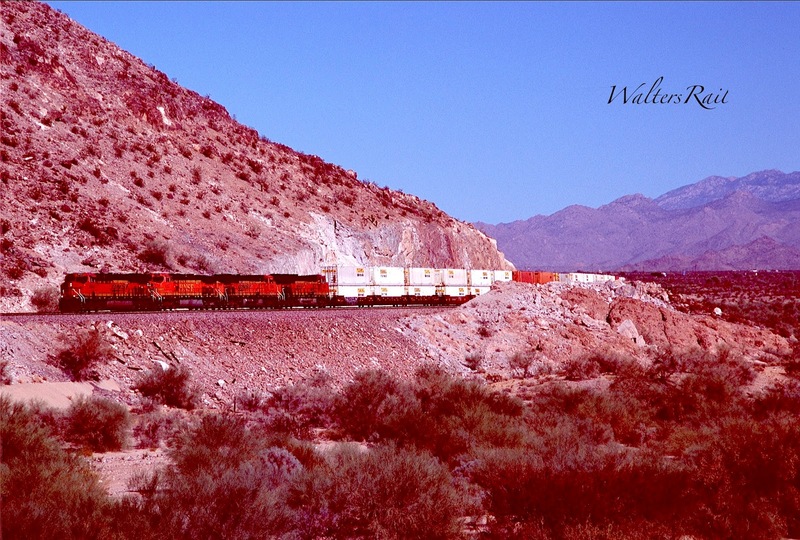 Kingman, Arizona, stands at 3,300 feet, a climb of almost 3000 feet in about 60 miles. 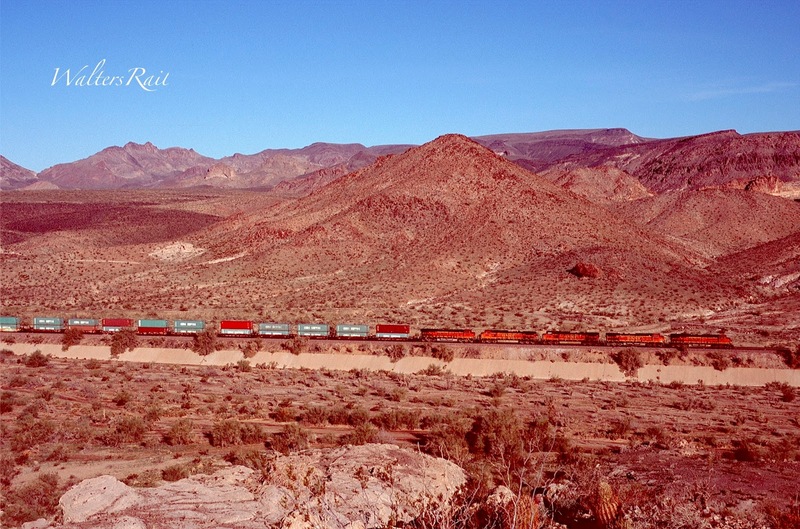 Eastbound BNSF freights (running compass north) climb steadily upgrade. Even the hottest Z-Trains rarely exceed 50 MPH. 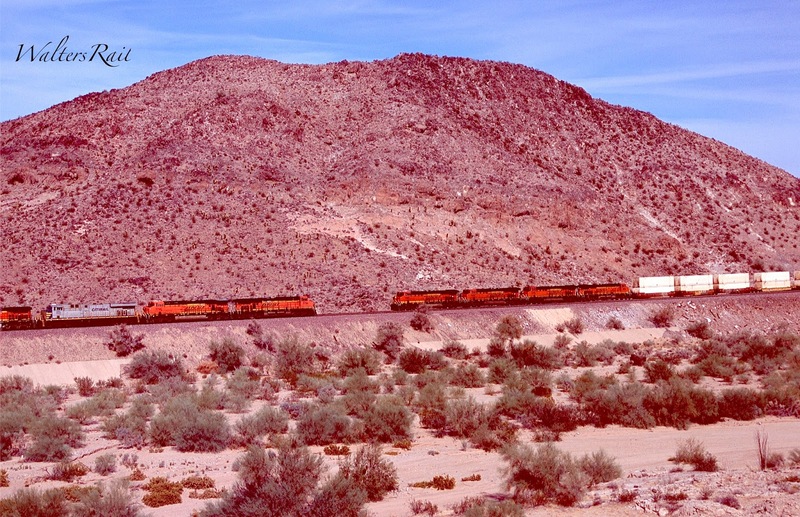 Westbound trains (compass south), on the other hand, race down the valley at track speed. The first time I drove through the Sacramento Valley was September, 1969. Gasoline sold for about 23 cents per gallon, and I was on my way to college. 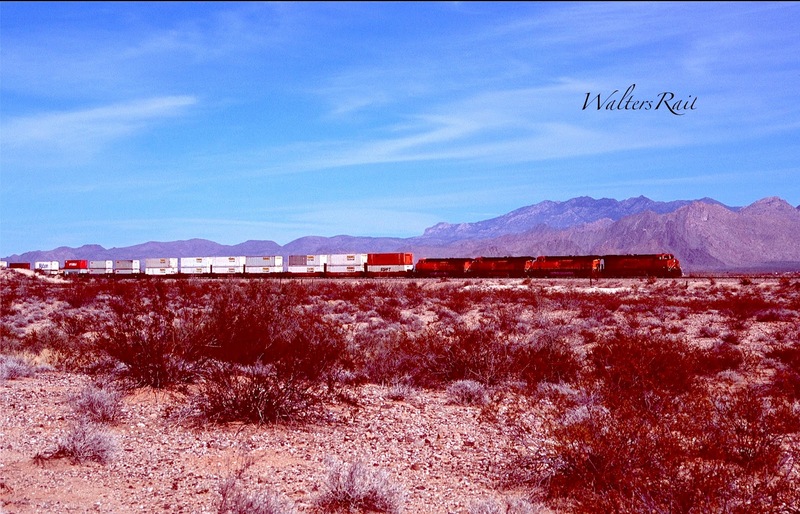 Interstate 40 was still a vision in some engineer’s head, and old Route 66 shimmered in the Mojave heat. I was driving a Corvair, a rear-engined, air-cooled, would-be sports car that had been savaged by Ralph Nader in a book that failed to acknowledge that General Motors had corrected all of the design defects Nader complained of so loudly. Nevertheless, the damage was done, because I had purchased one of the last Corvairs to roll off the assembly line. The Chevrolet dealer in my hometown of Edmond, Oklahoma, almost gave it to me -- my first car. I loved my Corvair, which was built on the Corvette suspension. I could whip around slow-moving vehicles and flash back into my own lane in the blink of an eye. But the Mohave Desert heat was giving the air-cooled engine fits. There was no water temperature to measure, but the oil was hot. The engine began to “miss” in forth gear, so I down-shifted to third, which increased the RPMs to about 3,000. This extra speed revved the engine fan and cooled things down. I roared across the desert like a mouse. The Sacramento Valley, and the Mojave Desert in general, receive an average of about five inches of precipitation per year – most of which falls during the “rainy season” from November to April. Thus, the water courses in this part of the world are generally dry. There are no rivers. 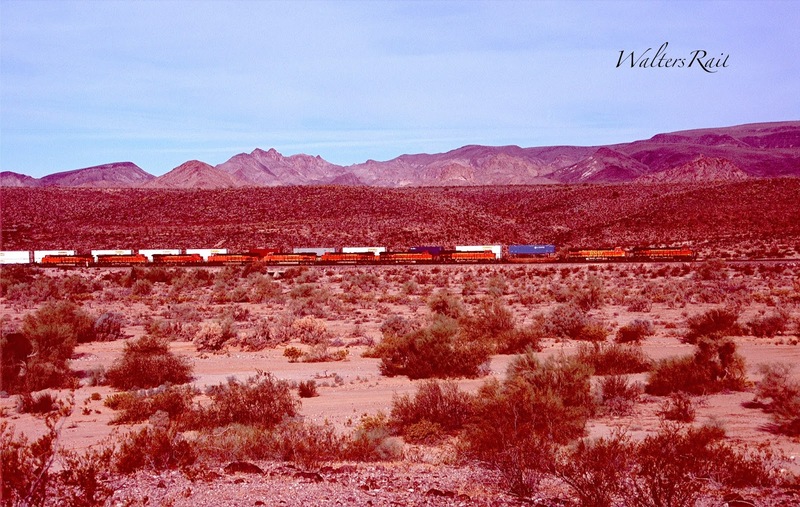 Instead, the main drainage routes from north to south, following the slope of the terrain, are called “washes,” which can fill to torrents when the rain is heavy but most of the year are populated by sand, tumbleweeds and cacti. The Sacramento Wash, the primary basin in the valley, is the first drainage south of the Havasu-Mohave Lakes Watershed, entering the east bank of the south-flowing Colorado River near Needles. The railroad more or less follows the course of the wash, crossing it on a splendid, concrete-pier bridge near the old (long-gone) station at Haviland. 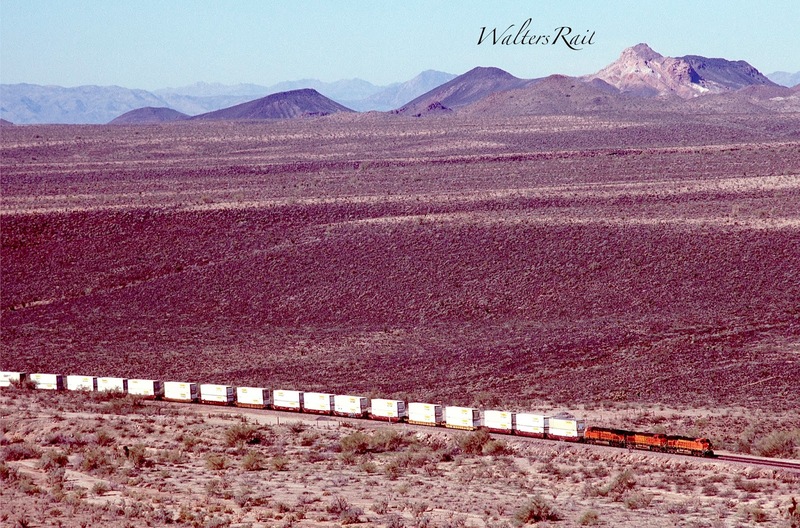 In my travels up and down the wash, I have noticed a fairly large number (50 or so) of small trailers, vans and even tents splayed across the desert. Much of this land is owned by the federal government, and it appears that hard desert-dwellers simply pick a location in the sand and “set up house” for a few weeks, months or even years. 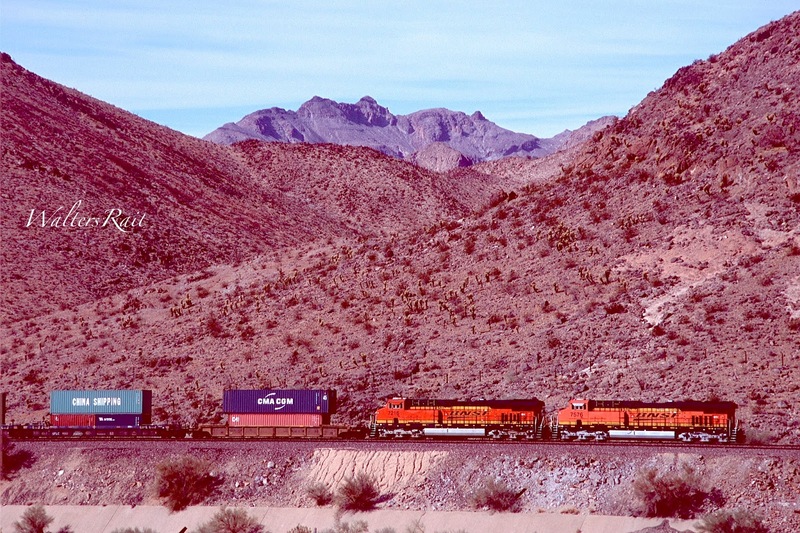 These are pushers on a westbound stack train (compass south) exiting Kingman Canyon at the north end of the Sacramento Valley. In the left foreground is the eastbound main constructed in the 1920's on a shallower grade. 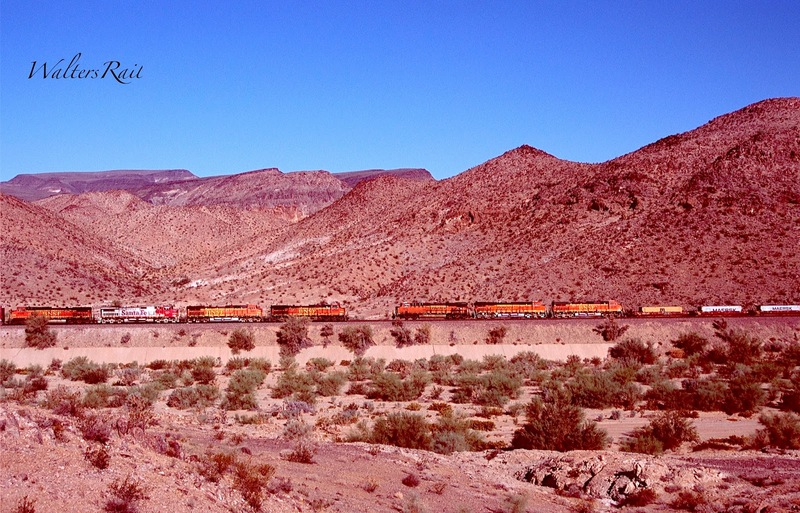 The National Old Trails Highway runs just in front of the train. 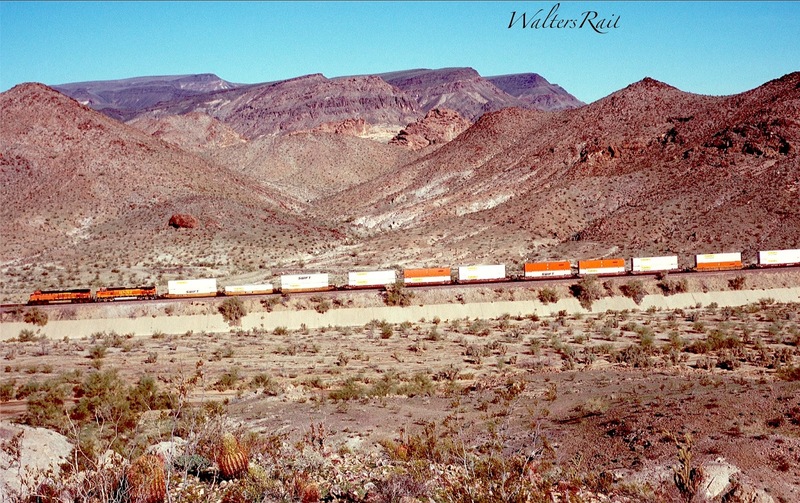 Old Route 66 is just behind the tracks, and just behind old Route 66 is I-40. One morning I was following a Jeep trail off I-40 across some rocky terrain when I saw an ancient Dodge van parked in a field of cacti. The van appeared to be filled with junk; even the driver’s seat was loaded with old clothing. I assumed that someone had abandoned the vehicle. I stopped my Jeep and climbed out for an examination. The doors of the Dodge were locked. There was not enough room inside for a small child. I saw a toaster oven, piles of magazines, old clothing, coats, boots, paperback books, newspapers, screwdrivers, hammers and a lawn mower – no kidding. Why anyone would abandon such a mess in the desert was beyond me. I shrugged and drove away. Two mornings later I returned to the same location. The Dodge van was still there. Then I swallowed – hard. The vehicle was now facing in the opposite direction. Since my last visit, someone had turned it around. My best guess is that the owner had been hiding up a hill behind rocks when I had last examined the vehicle. He had been watching me the entire time. Well, I was still alive, which meant that he had not shot me. I did not stop my Jeep this time, nor did I pass that way again. Well, you will look a long time before you find “another spot nearby.” If you are on foot, you will walk all the way to the Colorado River. 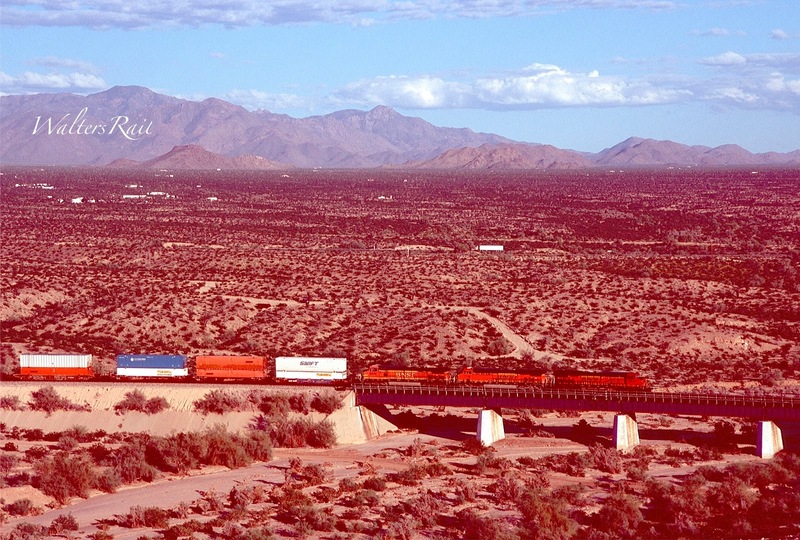 A short westbound manifest, with a UP unit and pusher, crosses Bridge 544.6 at the point where Happy Jack Wash joins the Sacramento Wash. Near the top left of the image, looking like a giant golf ball, is the Arizona Death Star. I do not know what it is, although it appears to be open to the public. Behind the Death Star and to the right are the Chrysler Arizona Proving Grounds, a huge installation where, I believe, Jeep Wranglers (among many) are tested. Since I drive a Wrangler, I tried once to enter the facility, but you can't get in unless you have a special pass, and I don't know how to get one. Bridge 544.6 can be seen easily from I-40. Getting there is another matter. I have found two routes. Neither is easy. First, take West Santa Fe Ranch Road, Exit 20, off I-40. Go west of the highway and follow a dirt/gravel road south, paralleling the interstate for a mile or so. The primitive road turns west, becoming less of a road and more of a Jeep trail. This is the spot where I saw the Dodge van filled with junk. Keep following the road downgrade through cacti and rocks and eventually you will spill into the Sacramento Wash. Four-wheel drive is a necessity here. Without it, you will quickly become stuck in the sand. Drive northeast down the middle of the wash for a mile or so and you will reach the big bridge. 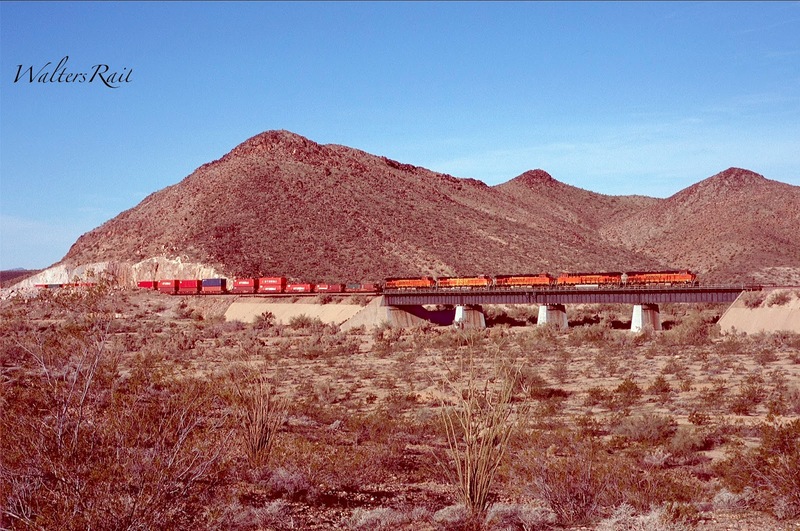 Here, a westbound Z-Train crosses Bridge 544.6, with Jumping Cholla cacti in the foreground. The branches of a Jumping Cholla are detached easily, so if you lightly brush against one, as I once did, you will walk away with more than you bargained for. The needles are painful to remove, even though they look fury. The alternate route is much more circuitous and can be reached without four-wheel drive, though I do not advise it. Take Exit 25 off I-40 and go east from the highway, turning right (south) on Alamo Road. You will pass something called the Arizona Death Star, which looks like a geodesic dome on stilts. I have no idea what it is, though it appears to be open to the public. The road will soon bend to the left. Stay on it until you reach Apache Road. Turn right (south). In about two miles, you will come to a fork in the road. Bear right. You will now be on the National Old Trails Road – a dirt path through the desert that was never hard-surfaced. Soon you will go down and across Happy Jack Wash. If you do not have a four-wheel drive vehicle, do not slow down or you will disappear in the sand. 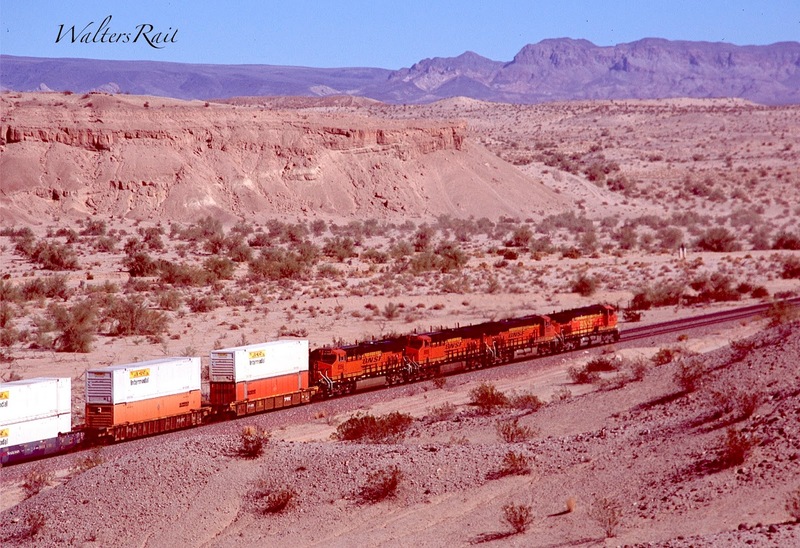 Shortly after you climb out of the wash, turn right on a dirt road that will quickly bend to the left (south). Stay on this road until it dead-ends. Turn right. You are now on Happy Jack Road which will lead you to an overpass across I-40. Stay on Happy Jack Road and it will lead you to Bridge 544.6. Several ancient campers and trailers speckle the hills east of the bridge. They look so decrepit that living in them seems impossible. Yet after my experience with the Dodge van, I suppose that almost anything is possible. I have spent many hours near the bridge, waiting for and photographing trains, and I have never seen anyone enter or exit any of these metal boxes. The Sacramento Valley is walled to the west by the Black Mountains, approximately 75-miles long and 10-15 miles wide. The high point is Mount Perkins at 5,456 feet. About 55,000 acres in these mountains are privately owned, the majority of which are mining claims that played out years ago. Federal land comprises 115,960 acres (Bureau of Land Management: 107,35 acres; Lake Mead National Recreation Area: 8,595 acres). The State of Arizona owns about 15,000 acres, and the Fort Mohave India Reservation accounts for approximately 19,000. 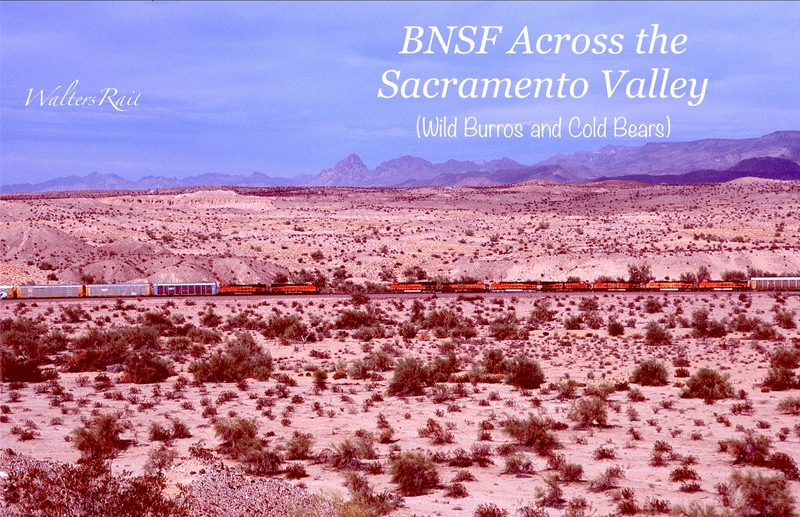 Landscapes in western Arizona are dominated by large, alluvium-filled basins separated by long, narrow mountain ranges – a perfect description of the Sacramento Valley and Black Mountains. Two tectonic episodes are responsible for the present topography. The first was an extension that produced movement on low-angle faults 15 to 22 million years ago. A second major faulting episode, the so-called “Basin and Range Disturbance,” occurred about 12-15 million years ago and produced much of the mountains that we see today. 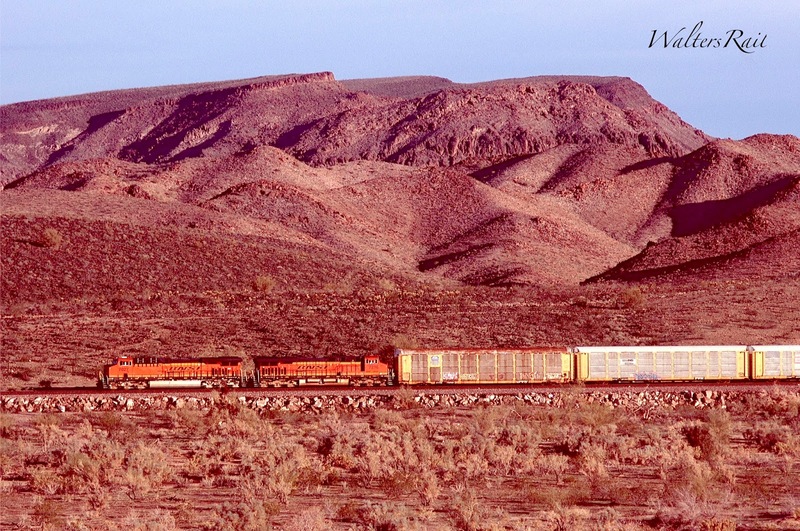 This latter faulting was accompanied by widespread volcanism, observable in multiple locations along the BNSF. In many places, the mountains are more dark red than black because of the wide disbursement of lava. 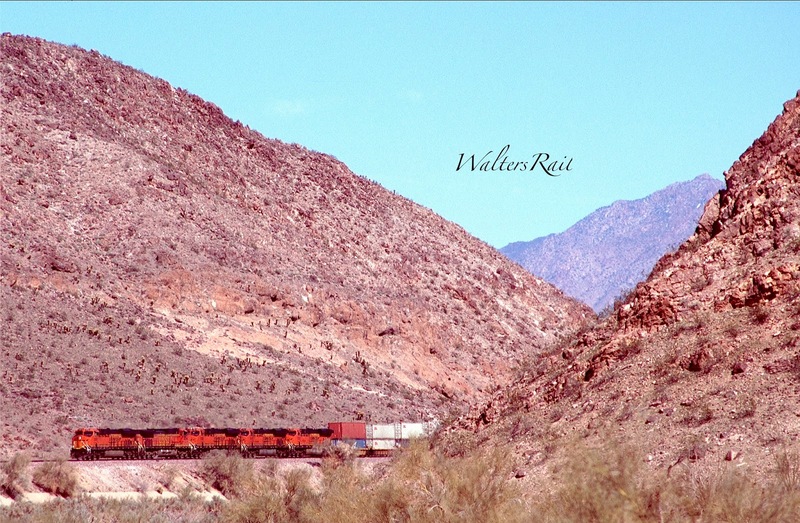 In years past, gold mining brought thousands of prospectors to these mountains. 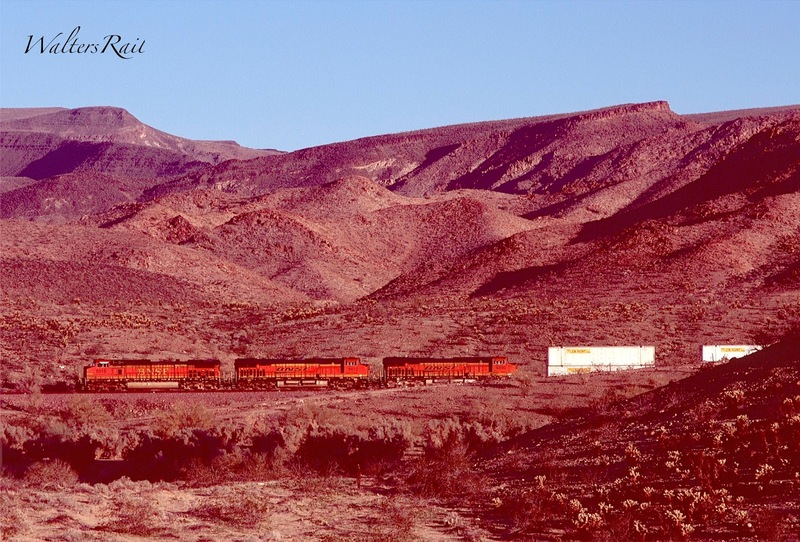 Oatman, Arizona, was settled over 100 years ago as a tent camp. In 1915, two miners struck a $10 million gold find, and within a year, the town's population grew to more than 3,500. The town was named after Olive Oatman, a young girl kidnapped by Apaches, sold to Mojave Indians and later rescued in a trade in 1857 near the current town site. 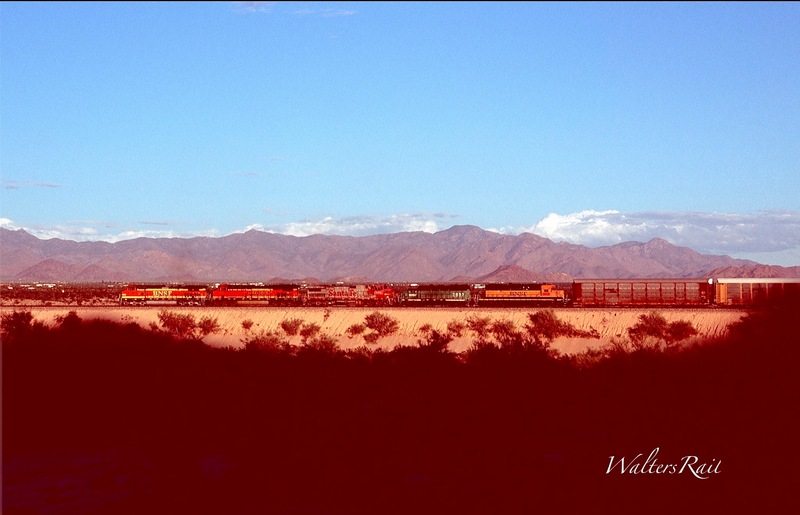 A Kansas City Southern "Retro-Belle" is sandwiched between BNSF "Heritage II's" on a westbound manifest. The Black Mountains rise starkly in the background. The dark rock at the top looks like lava from the many volcanos that erupted in this area millions of years ago. 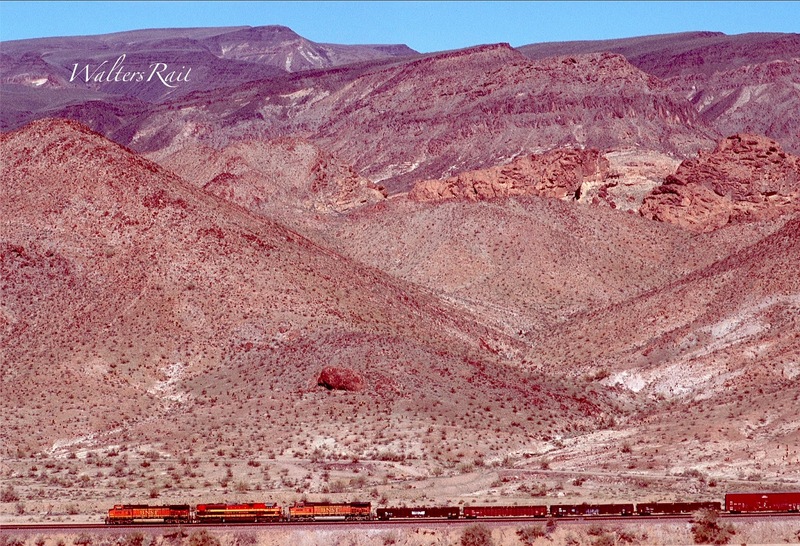 Oatman, Arizona, lies near the top of these mountains about 30 miles distant. 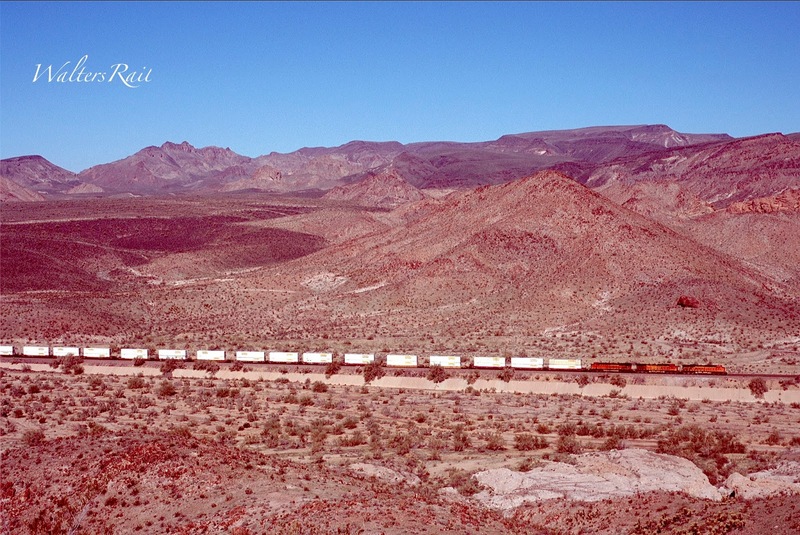 The first highway across the Southwest – the National Old Trails Road – climbed the Black Mountains to Oatman. The road still exists today and indicates just how far highway construction has progressed in 100 years. The road surface is black-top slowly returning to nature. Weeds grow through the pavement at regular intervals. To say that the road is narrow, winding and dangerous is to understate all three adjectives. I would never drive this route in the dark. There are not many guardrails, and the drop to canyons below is often 500 feet or more. 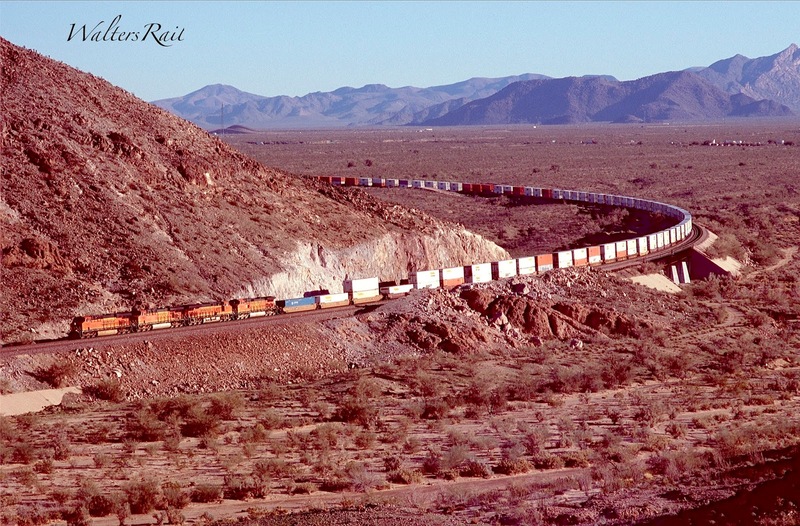 Many of the horseshoe curves are so severe that you almost have to stop your vehicle, back up, turn the wheel and then go forward again to stay on course – like a railroad switchback. 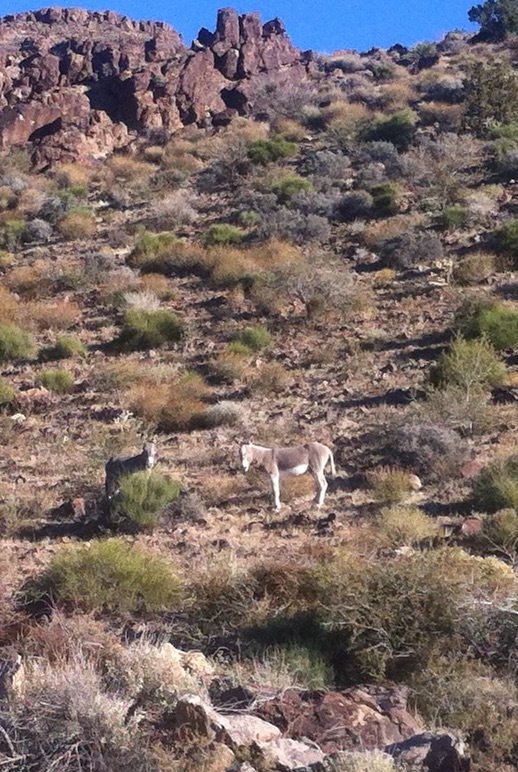 As you approach Oatman, you will likely see some of the wild burros that populate these hills -- descendants of burros brought here by miners in the late 1800’s. When the miners no longer needed them, the burros were turned loose and have “naturalized” themselves in the mountains. Each morning they come into town looking for food, wandering the streets and greeting tourists. Burro pellets and carrots are for sale at many of the shops. At sunset, they wander back to the hills for the night. 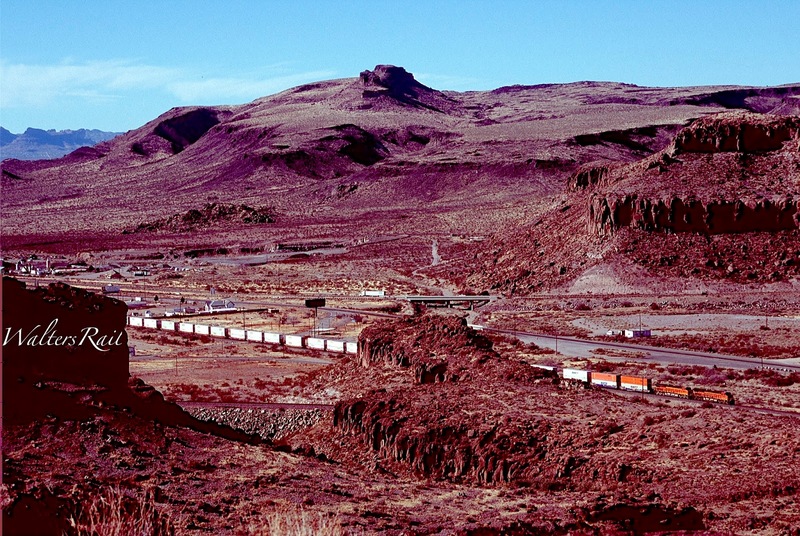 Gold mining played out rapidly around Oatman. 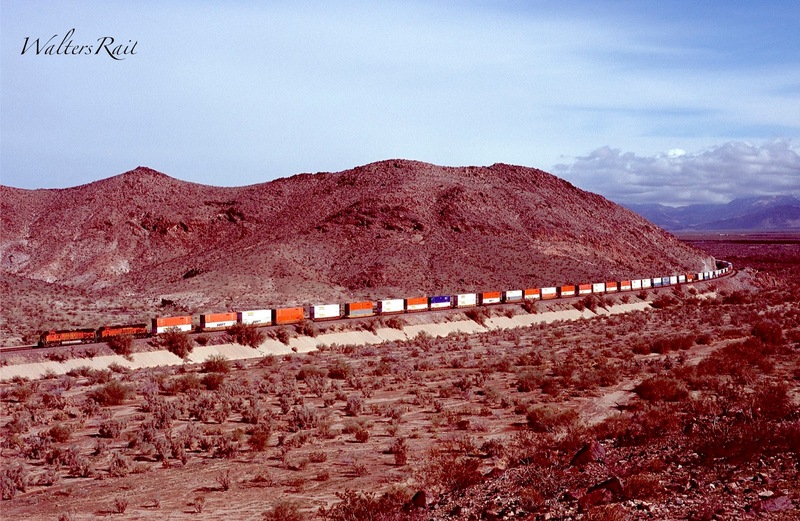 The primary mine was closed in the 1920’s, and the main highway (Route 66) was re-routed through the Sacramento Valley in the 1930’s – to avoid the dangerous mountain grades. 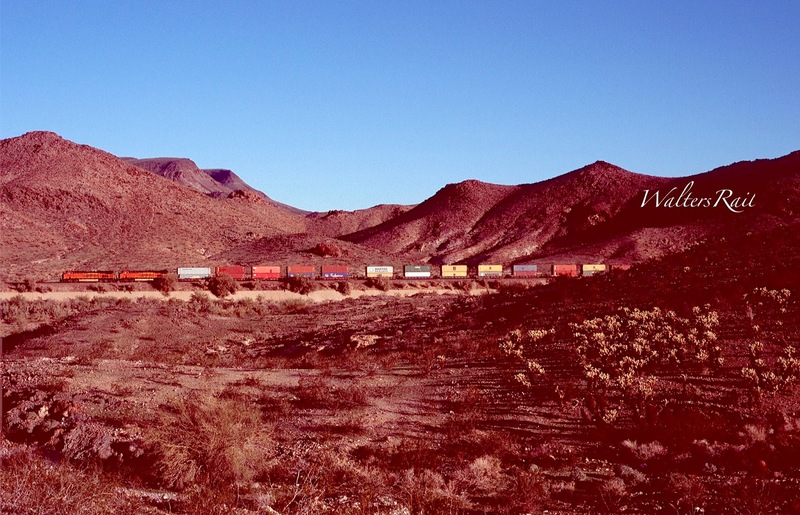 Somehow, Oatman has survived into the 21st century as a tourist attraction. I took my wife there once, and she was enchanted by all the “trinket shops,” though I don’t think she purchased anything. The local residents look like typical desert dwellers, with rough, dark skin and wind-blown hair. My wife and I stopped at a local bar. The beer was cheap and cold. 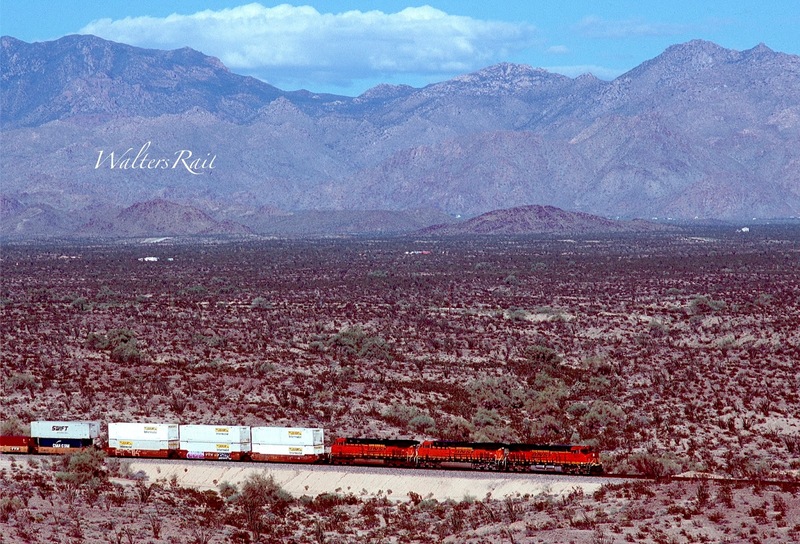 The Hualapai Mountains rise on the eastern border of the Sacramento Valley. 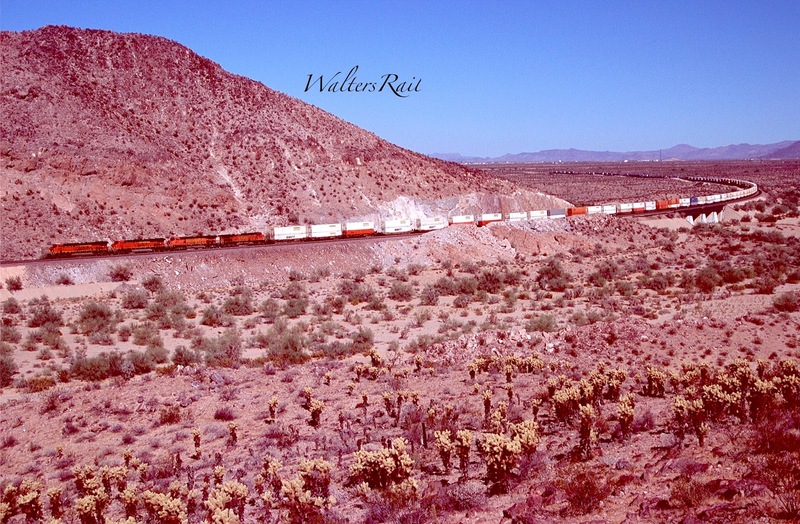 “Hualapai" means "People of the Tall Pines" in the Hualapai language. 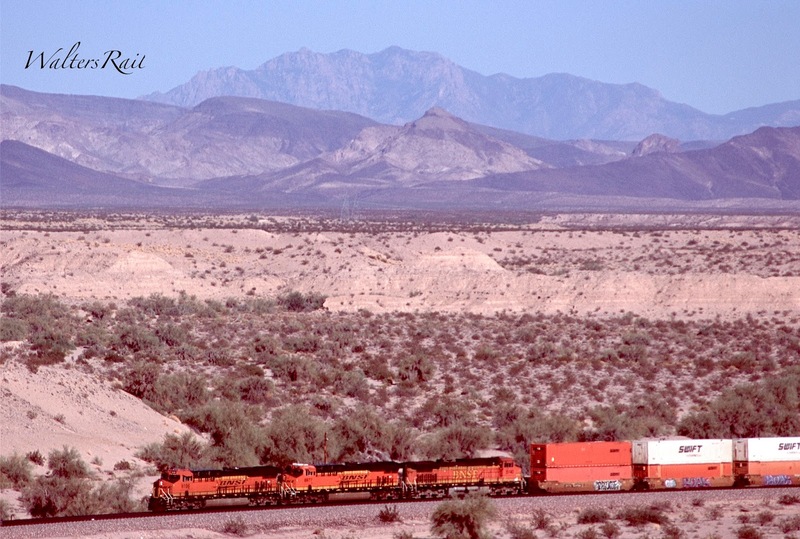 The mountain range consists of five main peaks: Dean, Getz, Aspen, Hayden (overlooking the broad Hualapai Valley to the north toward Kingman) and the tallest, Hualapai, standing guard over the Sacramento Valley to the west. The Hualapai Mountains generate enough rain to support Pinyon Pine above the desert valley. Above 5,500 feet, Ponderosa Pine appear. Most of the trees are found on the cooler, north-facing slopes. Even higher elevations support one of the most unique geographic areas in North America – the Madrean Sky Islands. In northern Arizona and New Mexico, the Colorado Plateau and Rocky Mountains are filled with snow-capped peaks and clear-flowing rivers – the “Mogollon Rim,” the edge of North American temperate mountains. The largest continuous stand of ponderosa pine in the world is found here. 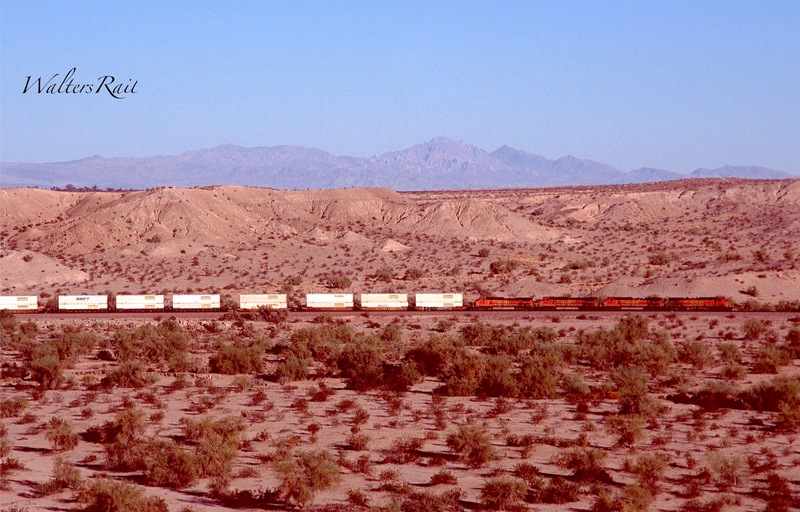 To the south is a portion of the Basin and Range Country, broken mountains and desert valleys. In the opposite direction, the other major mountain spine of North America, the Sierra Madre Occidental and its subtropical forests of pines and parrots, flattens out just before reaching the Arizona-New Mexico border. Here, entirely different plants and animals have developed in the warmer subtropical temperatures. Connecting these two major mountain ranges, 40 distinct mountain chains form the Madrean Sky Islands of North America. Added to this is the Sonoran Desert of western Arizona and northwestern Mexico, where Saguaro cacti climb eastward into higher elevations. 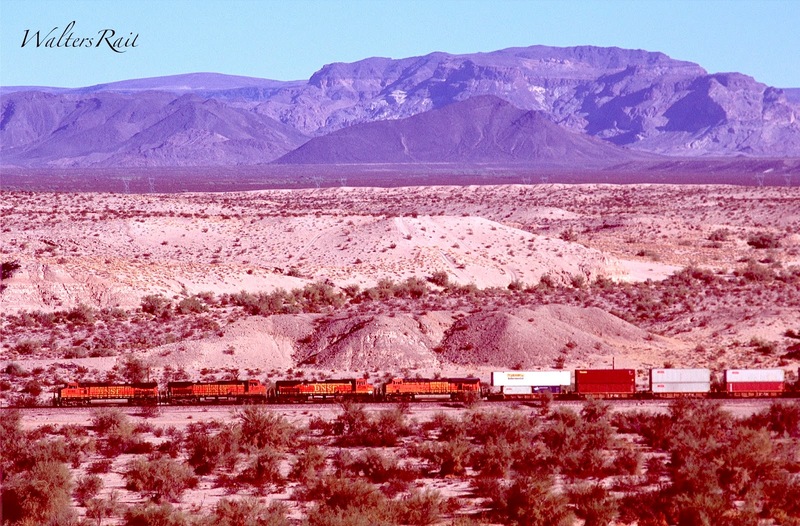 Farther east, the Chihuahuan Desert climbs westward over the lowest point in the Western Continental Divide towards a meeting with the Sonoran Desert, the Rocky Mountains and the Sierra Madre Occidental. These two convergences—the north-south span of the temperate and subtropical mountains, plus the east-west overlap of the Chihuahuan and Sonoran deserts—create the setting for an amazing intermingling of plants and animals. Lower elevations in the Sky Islands are hotter and drier; higher elevations are cooler and wetter. Valley floors vary from 2,500 and 4,500 feet; mountains peaks reach 6,000 to 11,000 feet. With 40 distinct mountains, each providing up to 6,000 feet of elevation gradient from valley to peak within 20 miles or less, the Madrean Sky Islands are unlike any other geographic region on earth. One mountain in the Sky Islands hosts more than half of all the bird species found in the United States, including the Eared Quetzal, the Flame-Colored Tanager and the Gray Hawk that live nowhere else in the United States. The Sky Islands also host the greatest number of mammals in the U.S. Javelina, Coati, Bighorn Sheep, Black Bear and Black-Tailed Prairie Dogs live there. Bee, reptile and ant diversity is unique, too, demonstrating subtropical influences. 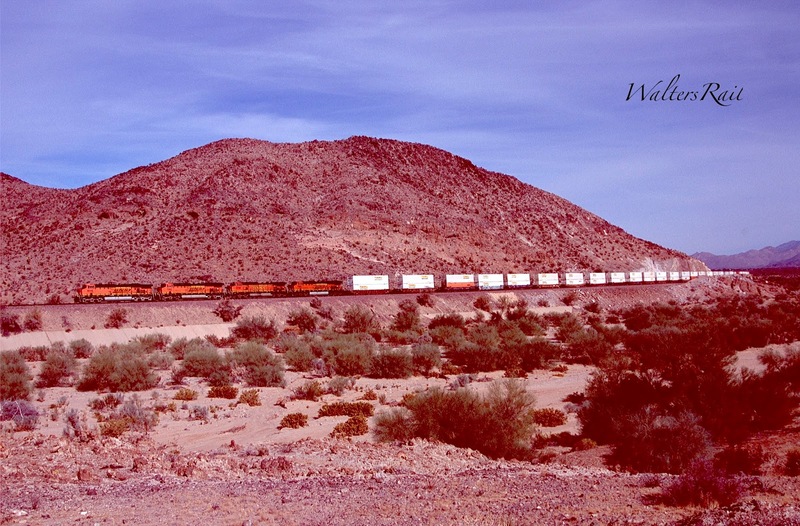 Hualapai Peak, the highpoint of the Hualapai Mountains, is easily visible from all points in the Sacramento Valley. I have read that there is a trail to the top, though I have not climbed it. Climbers in 2000 encountered a very rugged trail littered with downed pine trees, so I imagine that the route is now (in 2017) even more difficult. Because I have just turned 66, I will probably confine myself to the valley. However, you never know. I have done some crazy things in my life. The confluence of the Sacramento Wash with the Colorado river occurs at the Topock Marsh, east of the main river channel. I have driven through the marsh before on some very primitive roads. Four-wheel drive is an absolute necessity. Even with it, you may get stuck in the incredible sand bogs. I drove through in the winter. 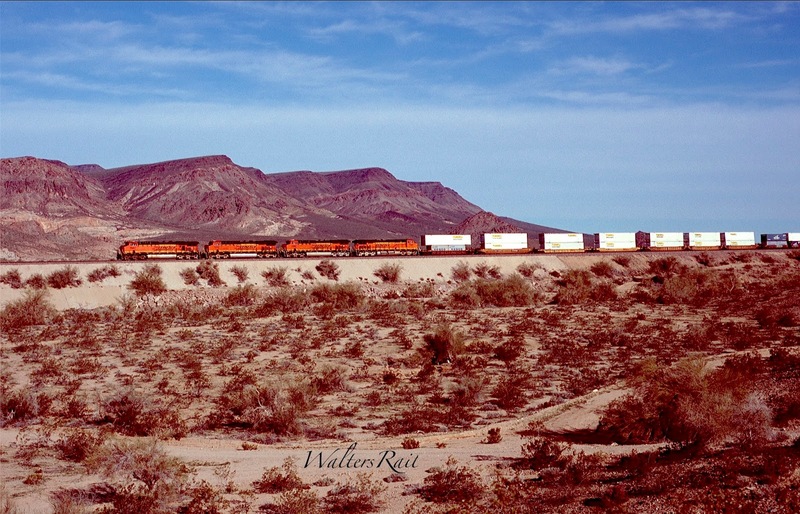 There are some very good shots of the BNSF running along the edge of the marsh, but the sun angle is appropriate only in the summer. My suggestion, for what it is worth, is to avoid this area unless you have a Jeep Wrangler. I do, and I found the going very difficult. Upgrade slightly from the Topock Marsh, the BNSF runs due east and west as it descends into the river valley. 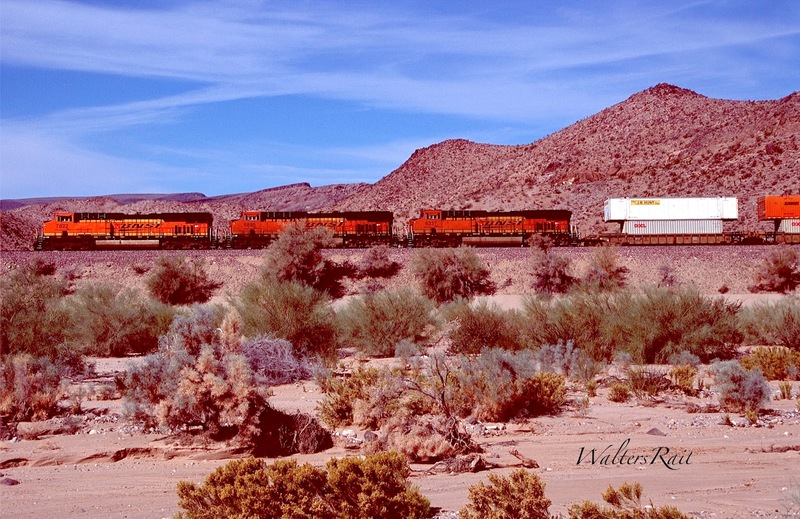 One day in late November, my dog Bear (aka Mighty Dog) and I navigated my Jeep through the sand to a series of bluffs overlooking the tracks and the Sacramento Wash. The day before had been hot. Both Bear and I had drunk much water to stay hydrated. On this day, however, a cold front had roared through. The wind was hard out of the north, with a temperature in the low forties. Bear is a “Chihuahua Mix,” but I don’t know what the “mix” is. He has very short, black hair. I had set up my tripod on one of the bluffs. The wind was so strong that I had to hold the tripod to keep it from blowing over. Bear was cold. He lay down on his belly and pushed his snout into the sand. Then he looked up at me. If he could speak, he would have said, “I’m freezing! Can we go back to the Jeep now?” I was also cold. I took a couple of shots, then we retreated through the wind and blowing sand. This image was taken while Bear, aka Mighty Dog, was attempting to burrow into the sand. The wind was howling. The ubiquitous creosote bushes were waving like flags. This experience helped me understand how wind alone sculpts the desert. The Sacramento Valley and the Madrean Sky Islands are some of the most amazing geography in the world. 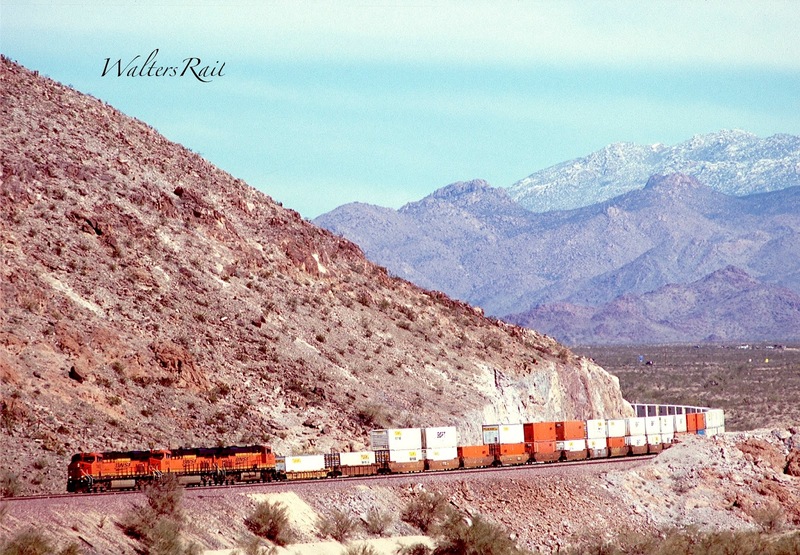 Even better, for railfans at least, the busy BNSF Transcon runs through the middle of it all. As I said, if I had one day to live, I would live it here.